Looking to add custom shot glasses to your wedding or party bar? Maybe you are a trendy couple who wants to host a beer and wine tasting for your wedding party. Maybe you have the kind of family where tequila shots are a given at any gathering. Maybe you need something to make your bachelor or bachelorette party extra special. If any of these sound like you, then customizing For Your Party 2 oz shot glasses is a great wedding favor to ensure a blast is had by all. Design your durable plastic shot glass with your own monogram or any personal wedding details. Not exactly the type to have wedding shot glasses? 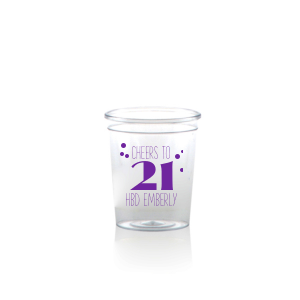 Don’t worry, you can save that crazy side for the bachelorette party and order our “Bride to Be” design, or finally let loose on your 21st and get our "Cheers to 21!" 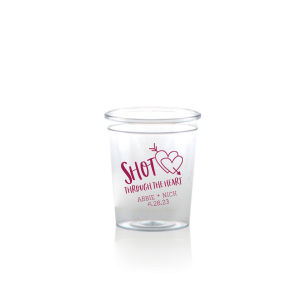 plastic shot glass design. 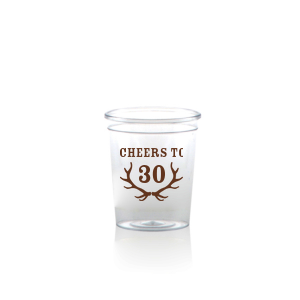 Or use them as personalized plastic tasting glasses! Try creating your own design in the For Your Party customizer and choose from our vast library of graphics. Determine which color best matches your party theme from our wide selection of print colors. Design your custom shot glasses for a family reunion, bachelor party or that upcoming college reunion. Browse our extensive gallery for the right plastic shot glasses for your party.